The Most Powerful Food on the Planet? Flaxseed is considered by many to be one of the most powerful foods on the planet. When you look back at its history, this may have always been the case. In the 8th century, King Charlemagne believed in the health benefits of flaxseed so strongly that he passed laws that required his subjects to consume it. Today, science is finally able to provide some evidence to support Charlemagne's beliefs. One key benefit of flaxseed is its fiber content. Fiber is an important factor in our diet, yet the average person in America has a fiber intake of less than 10 grams per day. For optimum health, to prevent certain forms of cancer (colon or breast), and aid in the prevention of heart disease, you need between 25-30 grams of fiber a day! Luckily, nature has an answer for that. Flaxseed (stabilized, ground) is one of the highest sources of soluble fiber known. Flaxseed contains approximately 28% soluble and insoluble dietary fiber, with about 30 - 40% of the total being soluble. Research has shown that fiber lowers cholesterol, modulates glucose, improves gastro-intestinal function and reduces the risk of colon cancer. Sufficient fiber in the diet is vital to good health. This is why you’ll find flaxseed as an ingredient in Jon Barron’s Private Reserve Superfood formula. Flaxseed is also one of the richest sources of valuable omega-3 fatty acids, with 57% of its fat being omega-3's. Just one tablespoon of flaxseed contains about 2.5 grams, equivalent to more than twice the amount most people get through their diets. Since flaxseed is considered to have antioxidant and anti-inflammatory benefits, it can also help relieve common risk factors for a wide variety of health problems that are associated with oxidative stress and excessive inflammation. The digestive health benefits of flaxseed are many. Since flaxseed contains fiber, it can act as a laxative, help to delay gastric emptying, and improve intestinal absorption of nutrients. It can also help the passage of food as it moves through our intestines. Since flaxseed is high in fiber, it can help ease the passage of stools, helping to relieve conditions such as constipation, hemorrhoids, and diverticular disease. For those with diverticular disease, flaxseeds may also keep intestinal pouches free of waste and thus keep potential infections at bay. Flaxseed oil may also help to calm inflammation and repair any intestinal tract damage. The oil is also thought to help prevent gallstones and may even dissolve existing stones. The omega-3 fatty acids in flaxseed have been proven to lower high blood cholesterol and triglyceride levels by as much as 25% and 65% respectively. They are necessary for proper eyesight, healthy skin, sperm formulation, brain development, and adrenal function. And they also decrease the probability of blood clots blocking an artery. Omega-3's also lower high blood pressure and help to decrease allergic responses in the body and help reduce all forms of inflammation in the body. In addition to helping lower blood pressure, flaxseed oil in particular, may also protect against angina (chest pain). A five-year study at Boston's Simmons College found that flaxseed oil may be useful in preventing a second heart attack. In clinical studies, Omega-3's have been shown to dissolve tumors, with over 1000 documented cases of successful cancer treatment. Flaxseed is one of the richest sources of lignans, a type of beneficial phytoestrogen. In fact, flax provides 75 - 800 times more plant lignans than virtually any other known plant source. These lignans have anti-tumor properties, and studies have shown that they might be extremely beneficial in preventing and possibly reversing breast cancer. In addition, omega-3 fatty acids lower the insulin requirement of diabetics and have been used in the treatment and prevention of arthritis. Since flaxseed contains all of the essential amino acids, it is a good source of complete protein. The bottom line is that flaxseed is one of the richest sources of valuable omega-3 fatty acids, fiber, lignans, and even protein. Most people get their daily flax in a pre-ground form to add to hot cereals or foods. The problem with using pre-ground flax, however, is that it normally begins to oxidize and go rancid within minutes of being ground and exposed to oxygen and light. As it turns out though, one of the primary triggers for going rancid is the presence of dark flaxseeds. Fortunately, removing all dark seeds and using only golden flax seeds before grinding helps keep ground flax stable for almost two years, without having to reduce the amount of Omega-3 fatty acids in the flax (the solution used by many manufacturers). In addition, ground golden flax comes in a super fine grind specifically for use in beverages that mixes beautifully and helps give a wonderful creamy texture to the drink. It is for these reasons that Jon Barron uses this form of flax in his Private Reserve Superfood formula. Interesting article. I have read somewhere that flaxseed is not necessarily good for men, because of the phytoestrogen it contains. Any views on that? Interesting comment about golden flaxseeds - I had known that preground flax went rancid fairly quickly, so as a result, I have always ground my seeds just before consuming them. I make a sourdough flax bread fairly often - delicious! I have read on several sites that flax seeds contain cyanide and that heating it distroys the cyanide. How long do I have to heat it? at what temperature? can I just pan raost it for a few minutes? Also, does the flax oil contain cyanide? Yes, there is a link between cyanide and flax; however, before you panic, there is also a link between cyanide and many other foods such as apples, cruciferous vegetables, sunflower seeds, pumpkin seeds, and macadamia nuts. Keep in mind that there are very small amounts of cyanide constantly present and undergoing metabolism in human tissue. These small amounts of cyanide are found in relatively non-toxic forms like thiocyanates. Of course, these same thiocyanates are also found to occur naturally in foods. Linamarin and lotaustralin are two of the primary cyanogenic glycosides in flaxseeds, and like the thiocyanates in cruciferous vegetables, both of these compounds can contribute to cyanide metabolism in humans. However, as long as our metabolic processes are not overloaded and we are in reasonably good health, about two tablespoons of flaxseeds per day are going to provide too little linamarin and lotaustralin to cause an adverse reaction. To provide some perspective, flaxseed meal contains about 5-6 milligrams of cyanogenic glycosides (CGs) per tablespoon. For comparison, oral doses of sodium cyanide and potassium cyanide that cause acute and dangerous toxicity in humans fall in the range of 1000's of milligrams. My local health food store carries golden and brown flaxseeds that I grind fresh daily. When you say to avoid dark flaxseeds because of rancidity, I assume that means brown flaxseeds are all right, but they would be more difficult to search through and eliminate dark, rancid seeds, Would that be correct? Brown flaxseeds are not rancid themselves; it’s just that they turn rancid much more quickly than golden flaxseeds after being ground up and exposed to air. That makes them problematic when included in products that contain ground flax—but they present no problem whatsoever when ground fresh daily. I have searched all over trying to find where you may have gotten your data on the fact that the Golden Flax do not go rancid while the dark flax does. Could you share where you got that information? Also, what is it about the golden flax that keeps it from going rancid in th first place, a particular antioxidant or polyphenol? Thanks in advance for your reply. I am having difficulty finding this particular type of flaxseed. What exactly is meant by the term stabilized, ground? Would it be described differently on packaging? "...Most people get their daily flax in a pre-ground form to add to hot cereals or foods. The problem with using pre-ground flax, however, is that it normally begins to oxidize and go rancid within minutes of being ground and exposed to oxygen and light. As it turns out though, one of the primary triggers for going rancid is the presence of dark flaxseeds. Fortunately, removing all dark seeds and using only golden flax seeds before grinding helps keep ground flax stable for almost two years, without having to reduce the amount of Omega-3 fatty acids in the flax (the solution used by many manufacturers). In addition, ground golden flax comes in a super fine grind specifically for use in beverages that mixes beautifully and helps give a wonderful creamy texture to the drink. It is for these reasons that Jon Barron uses this form of flax in his Private Reserve Superfood formula." >what is your recommended dosage based on my method of consumption.....should I grind more? True or False? Are flaxseeds highly estrogenic? As asked earlier by Richard Garland, i'd also like to know what is the recommended dosage? We do not diagnose or prescribe, merely provide information. So, it depends on your health goals. 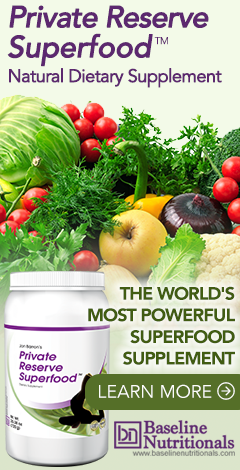 However, Baseline Nutritionals uses full doses of ingredients in their products. In Jon Barron's Superfood, they recommend 2 scoops per day, and each scoop contains 4,997 mg of organic Premium Gold Flax Seed--the kind that does not go rancid.